Art and science have co-existed in the life and work of Dr. Jack Kleinart, from carving teeth out of chalk on the entrance exam for dental school to meeting his future wife in a painting class. He moved to Seattle in 1975 and established a dental practice in Edmonds, retiring 30 years later. Throughout his career as a dentist, Dr. Kleinart has continued his interest in art by casting and fabricating metal jewelry, blowing and casting glass, sculpting with wood and cement, printmaking, as well as drawing and painting with children. He is active with Big Brothers Big Sisters, Pratt Fine Art Center, and is President of the School of Art Advisory Board at the University of Washington. 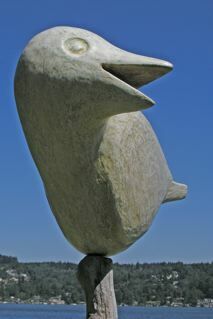 In 2005, Kleinart was selected for the Peace Arch Park International Sculpture Exhibition between the United States and Canada, and his work was featured on the brochure cover. Jack is inspired by universal elements of folk and ethnographic art with the added twist of scale and venue found in contemporary and modern art. His goal is to create a familiar form presented in an unexpected way.